With poppy seeds added for a slightly crunchy texture, these lemon-flavored muffins are perfect for breakfast, brunch, or anytime! Search our muffin recipes for more tasty muffins, including Blueberry Banana Muffins and our extra special White Chocolate Raspberry Muffins recipe. Preheat the oven to 400° F. Lightly grease the muffin cups or line with cupcake papers. 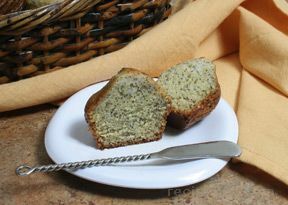 In a medium bowl, add the flour, sugar, poppy seeds, baking powder, baking soda, and salt; stir to combine. In a mixing bowl, blend together the eggs, yogurt, lemon zest, and vegetable oil until well mixed. Pour in the dry ingredients and beat just until mixed. Do not overmix the batter. 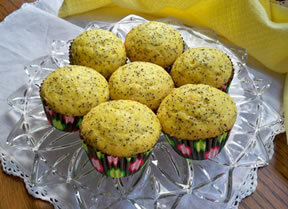 Spoon into the prepared muffin cups, distributing batter evenly between 12 cups. Place in the preheated oven and bake for 20 minutes or until a toothpick poked in the middle comes out clean. Do not overbake. Prepare the glaze by combining the sugar and lemon juice; stir until sugar is dissolved. Poke the top of the muffins with a toothpick, several times each. Spoon a teaspoon of the glaze over each of the muffins until glaze is distributed evenly on all the muffins. 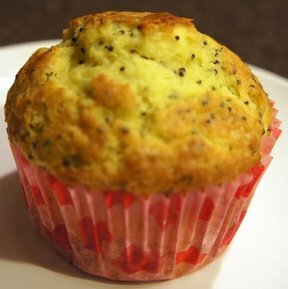 Allow the muffins to cool in the tins for at least 10 minutes before removing them.